Blocked toilets, drains or kitchen drain issues is a common problem in educational properties get it fixed fast with JLH Drains. No call out charge and fast arrival times guaranteed! Of course, most drain problems in schools and colleges are rarely so severe that they shut the entire property down, but losing use of facilities and possibly the nearby rooms can problems you could do without. We specialise in drain repair and preventative maintenance that delivers fast turnaround times, reliable and high quality results and all at affordable prices. Fully insured, extensively experienced and certified to carry out all kinds of drain works, JLH Drains are your ideal solution to any drainage problem. Arrange your FREE property survey and no obligation quotation at your convenience today; call us now on 0800 781 8922. Periodic maintenance checks are often a great way to reduce future disruption and costs. Our team arrange regular visits to carry out periodic maintenance using the latest CCTV survey equipment on your drain system to look for potential problems, carry out remedial works and clean out the system using a high pressure water jet. Drainage maintenance greatly reduces call out requirements and tackles most issues early when they are still small and easy to fix. Have total confidence in the team you’re hiring; at JLH Drains all our team carry CSCS cards and are trained and certified in skills such as working in confined spaces and street-works. We are fully insured, meet all health and safety legislation and guarantee emergency attendance within 90 minutes across Kent, Surrey, Sussex and much of London. Our regular area of work includes; Gillingham, Chatham, Rochester, Strood, Maidstone, Canterbury, Greenwich, Sidcup, Dartford, Gravesend, Higham, Newington, Sittingbourne, West Malling, Orpington, Swanscombe, Wigmore, Parkwood, Sheerness, Northfleet, Crayford, Sheppey, Whitstable, Margate, Herne Bay, Ramsgate, Faversham, Crayford, Medway and London. Keep everything at your school or university fully operational with a maintenance contract or if you already have a drainage problem call us. We are available 24 hours a day for emergency repairs. 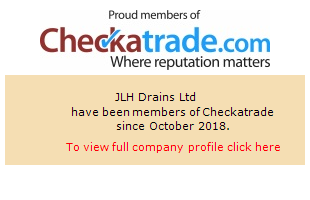 Get the complete service at JLH Drains for London and Kent; contact us today to arrange a full survey and quotation with one of our commercial drains experts.